May Bank Holiday weekend proved to be a busy one for us. After a Friday night at Carter’s of Mosely (review here) and a full Saturday at Birmingham Pride (review here) the hangover on Sunday morning was almost too much and threatened our attendance at the second beer fuelled Pride day in the sun. 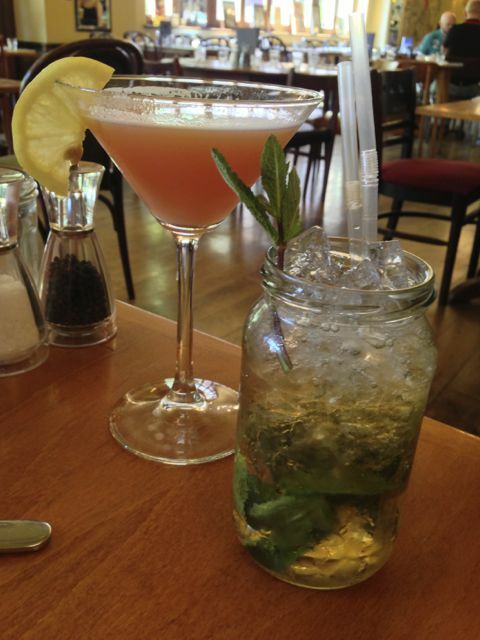 However help was on hand from Le Truc in the form of their new Sunday offering – Le Drunch. The idea behind Le Drunch is a chilled Sunday social – with food and a healthy injection of alcohol to help along the way. Have a Bloody Mary to tackle your hangover, or go for a Mint Julep to really get you going. From mid-afternoon there is a DJ helping you back into life too. The breezy atmosphere really makes you want to sit and chill for a few hours with friends, eating when you’re hungry, and drinking the wonderful cocktails. Le Truc, a rebirth of the now closed Chez Jules that was on Ethel Street, is located under the Ibis hotel in Chinatown fronting onto The Arcadian Centre. 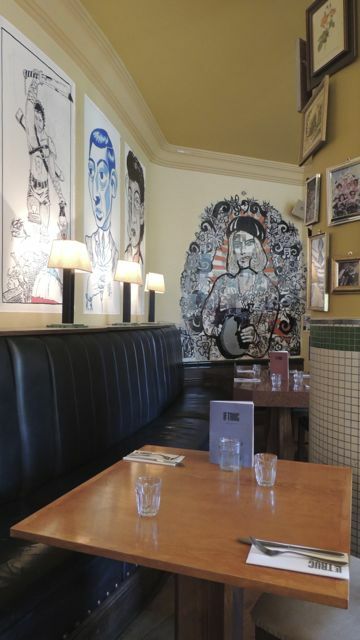 With the art on the walls, the cassette adorned DJ booth, and the random little touches that I’ll leave you to find yourself, the place feels far from the large chain restaurants that are often associated with French dining in the UK. The menu for Le Drunch Sundays varies from the nice and simple bacon sandwich, through a cut down selection of the normal French based menu, to a good old English roast beef dinner (we could hardly be Les Rosbifs without it now could we). Predictably the roast beef won for both of us on this occasion, and with the addition of some well recommended cocktails to wash it all down, we were soon back on form for the day. 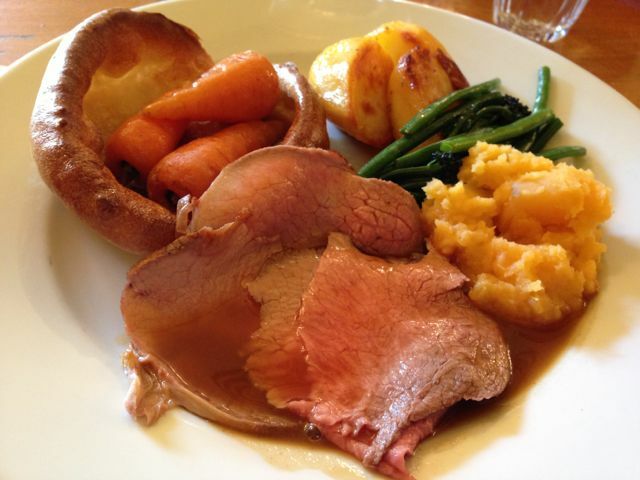 We were very pleased to see that Le Truc have chosen to serve their roast lunches plated. Yes that’s right a plate. They’ve left the roof tiles where they should be on the roof, and the floor tiles doing a superb job of providing a surface to walk on. We didn’t even have to carve. The roast beef came served with one of the best Yorkshire’s I’ve had for a long time with some lovely and flavoursome baby carrots, gravy, some crispy roast potatoes, green beans and some swede mash. We asked for one medium and one rare, and that’s what we got. The normal menu is also lovely – think slow braised pigs cheeks, fillet of lemon sole, steak tartare, and goats cheese bonbons. Three courses with a couple of cocktails or wine, will be about £40 a head. This entry was posted in Area: Arcadian, Area: China Town, Cuisine: French, Price: Average, Venue type: Bar, Venue type: Cocktail Bar, Venue type: Pub, Venue type: Restaurant, Venue type: Wine Bar and tagged Birmingham Restaurant, birmingham restaurant review, birmingham review, Out In Birmingham, out in brum, OutInBrum, restaurant review, Where To Go In Birmingham. Bookmark the permalink.